With the sudden appearance of pianist Nik Bärtsch and Stoa (ECM, 2006), a new musical paradigm emerged from Switzerland: a rigorous musical aesthetic combining post-Steve Reichian minimalism with funk and cross-cultural tinges of Japan and Indonesia. Bärtsch's music actually dates back to the early part of the millennium, but it was ECM's attention that gave the "Zen Funk / Ritual Groove Music" of Bärtsch's Ronin the opportunity to gain international acclaim, both critical and popular. Ongoing Monday night gigs at Zürich's Montags club have given Bärtsch a forum to refine and expand his concept, but he's not the only one exploring its broader purview. Ronin bass clarinetist/alto saxophonist Sha explored a more lyrical side of the equation with his Banryu debut, Chessboxing Volume One (Ronin Rhythm, 2008), while pianist Mik Keusen (a Banryu alum until its disbanding earlier this year), released his own Blau (Tonus) three years prior. With Nalu, Keusen's Blau functions, in many ways, parallel to Ronin and Banryu, but with its own angle. Sha is also a member of Blau, and while his contributions are so spare and understated as to raise questions about their value, his rich tone and careful constructions spending more time in economical ensemble counterpoint to Keusen's arpeggiated pianism rather than blowing hard or heavy add plenty to Blau's overall sound. Like Banryu, Blau also includes a female voice, but unlike Sha's singer, bassist Anna Trauffer's vocals are wordless, at times meshing so seamlessly with Sha as to create a new, singular voice. Trauffer's double-bass, and its dual potential as a pizzicato and arco instrument, adds its own specificity to Blau, contrasting Ronin's Björn Meyer's or Banryu's Thomas Tavanoelectric bassists, both. Like Bärtsch and Sha, Keusen's compositions are simply numbered, with the addition of a single decimal point implying the possibility of variants on larger themes, as on Blau, where a medley of "9.0/9/1" was followed, later, by "9.2." With all the apparent similarities how does Blau stack up against Ronin and Banryu? Compositionally Nalu is less knotty and more direct. Less concerned with interlocking parts, percussionist Fredrik Gille plays a more obvious support role, less crisply defined than Ronin's decisive rhythm team of drummer Kaspar Rast and percussionist Andi Pupato. There's a stronger sense of lyricism on "26.0" and, on "23.0," an almost songlike vibe in its second half, where Sha takes a rare solo spot over its relentless 4/4 pulse and Trauffer's layered vocals. Keusen's playing feels a tad more reckless than Bärtsch's architecturally organized approach, though it's still largely integrated within the pianist's compositional roadmaps. 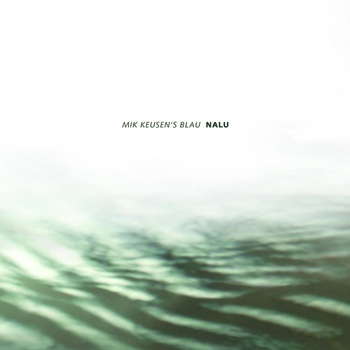 Bärtsch fans will find much to like with Keusen's Blau. The expanding axis of this Swiss aesthetic speaks against surface-layer monolithism and more to its patiently unfolding potential. Born of Ronin, perhaps, Nalu still speaks with its own voice, with melodism an equal partner to reduction and minimalist-informed repetition, compelling grooves and an improvisational layer embedded so seamlessly as to be largely indiscernible from Keusen's engaging structures. Track Listing: 25.0; 16.0; 26.0; 21.0; 12.0; 23.0; 22.0. Personnel: Mik Keusen: piano; Sha: bass clarinet, alto saxophone; Anna Trauffer: double-bass, voice; Fredrik Gille: percussion.